Hi Frugalistas! 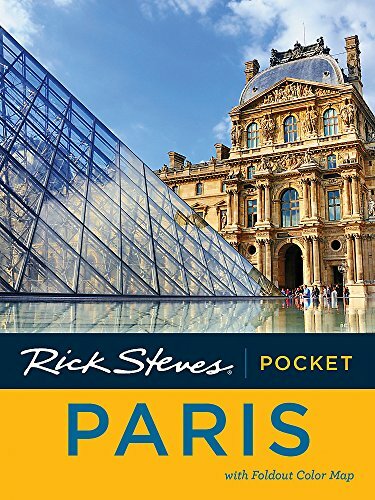 I hope you are enjoying my Paris itinerary series, whether you are planning a trip to Paris, or just like reading about Paris. Following from my one and two day Paris itineraries, I’m now considering what to do on a three day trip to Paris. Paris in three days definitely gives you far more options for what to do in Paris. 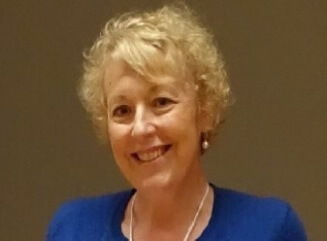 If it is your first trip to Paris I think three days is a good length of time to spend – plenty of time to see all the “must sees” but not so much time as to be overwhelming if it is your first stay. Three days in Paris is still not ideal, but it does give you plenty of time to see things. Importantly, I think, it gives you the option to travel to Paris and not have to rush around to fit everything in. It also gives you the option to travel further afield. To make the most of your three days in Paris itinerary I do recommend buying a Museum Pass or skip the line ticket. The minimum length Museum Pass you can buy is two days so plan your museum activities based on how much you think you will use it – don’t just buy a three day one “just in case.” I always suggest a centrally located hotel as being your best option unless you are very familiar with a destination. There are a number of Paris arrondissements to choose from in Paris, but my suggestion would be either the first, second or the Marais for this itinerary. As always in Paris you do need to plan your Paris trip with museum closures and special arrangements in mind. The Louvre and Musée d’Orsay are both free on the first Sunday of the month which means they are particularly busy that day. If big crowds worry you, you might like to change the order of your itinerary (but the Orsay is closed on Monday). The Louvre is closed on Tuesdays, and Versailles on Monday. 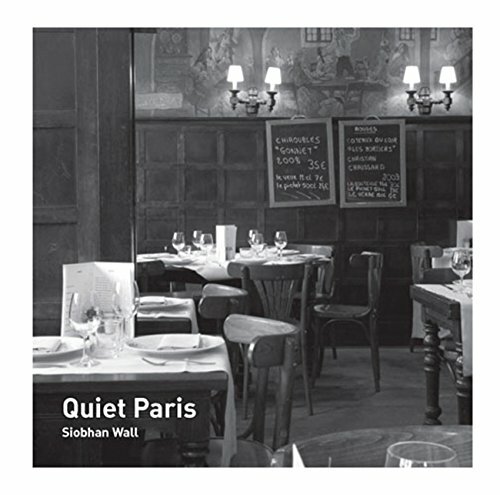 Wednesdays both the Louvre and Ste Chapelle are open until 9.30pm. Similarly, the Orsay is open late on Thursdays and the Louvre is open late again on Fridays. 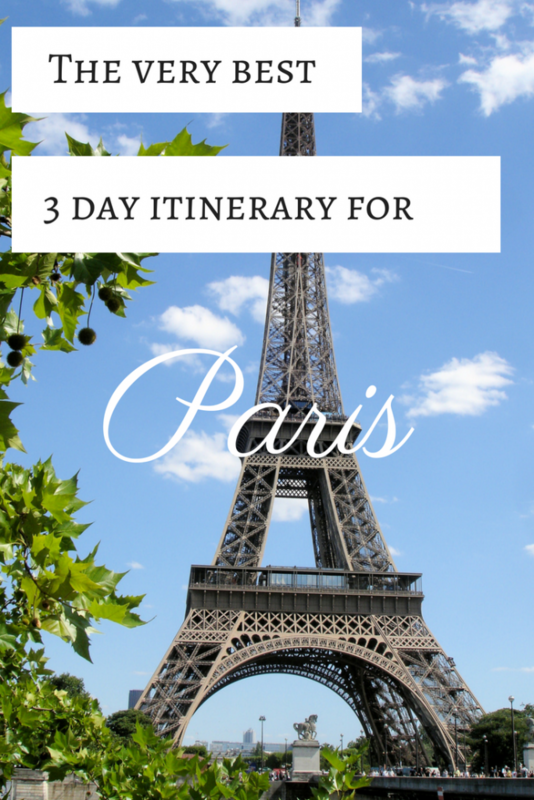 My basic three day Paris itinerary builds on my previous Paris itineraries. 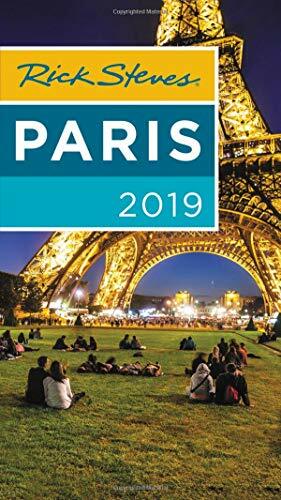 The basic order will be the same as my Paris in two days itinerary, with extra things added to the third day depending on your specific interests. The Chateau and gardens of Versailles. Start morning one, day one with a trip to the Louvre. 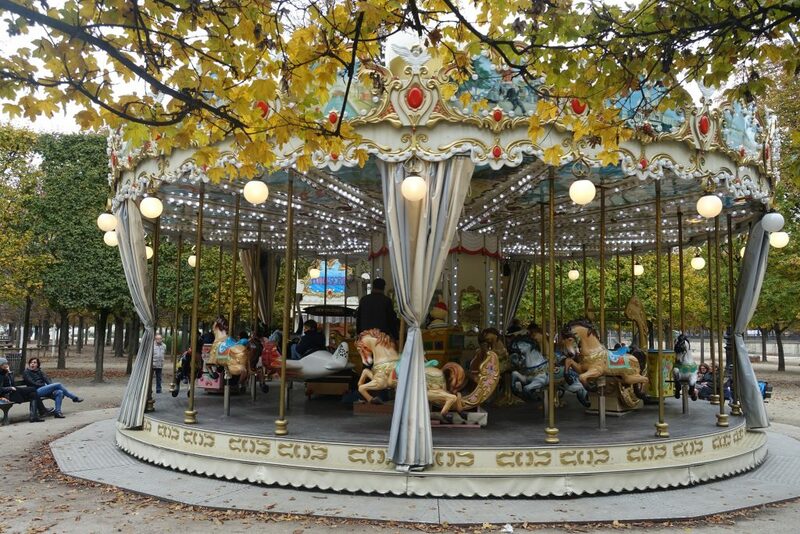 You can visit the Tuileries garden before or after depending on the weather. Plan to spend around two hours on a basic Louvre tour, unless you are an art lover, when, of course, you will want to linger longer. Next it’s time to head along the Seine towards the Pont Neuf and the Ile de la Cité. First up on the Ile de la Cité is the Conciergerie. It is rather spartan, but contains a Revolution prison museum, which personally I found quite interesting. 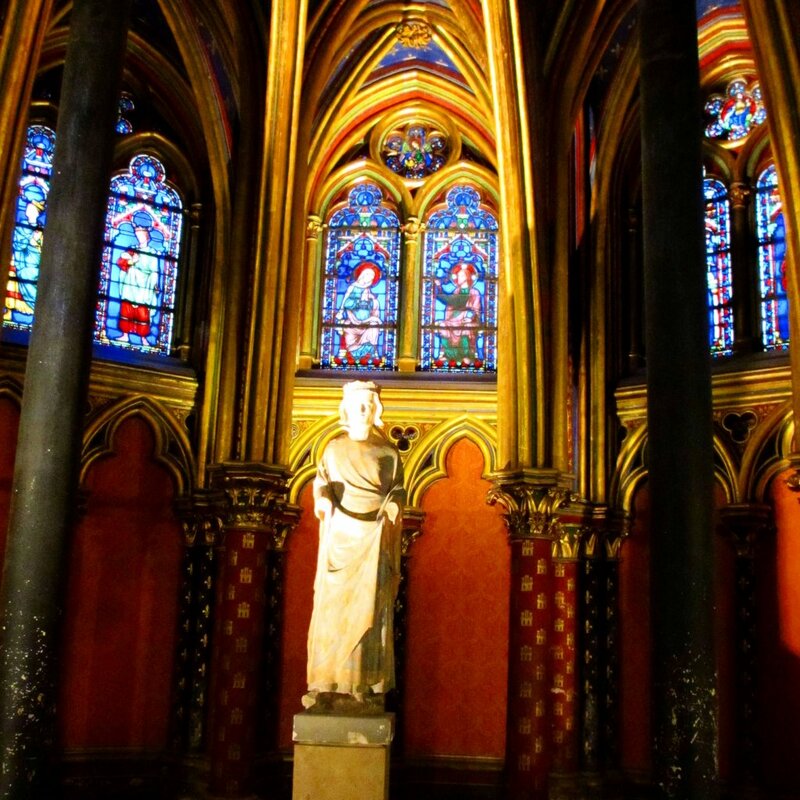 Don’t worry about the Conciergerie being spartan, because our next destination is anything but – the gorgeous Gothic jewel that is Ste Chapelle. Turn right out of the Conciergerie and find the queue for the next door Ste Chapelle. Even with a Museum Pass or skip the line ticket you will need to queue for security so don’t panic. Once through security just show your ticket/pass to gain entry rather than queuing again. Ste Chapelle is a genuine delight, so don’t rush to your next destination. Just relax and absorb one of the most dazzling sites in Paris. 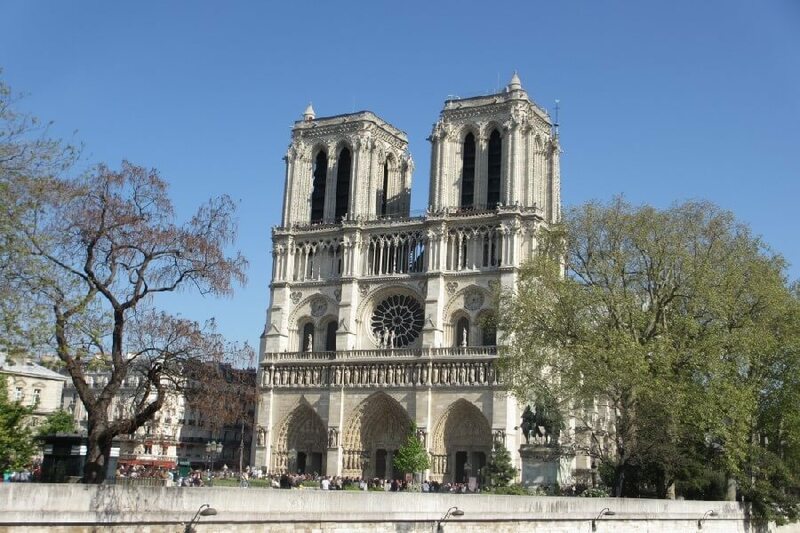 Once you manage to drag yourself away from Ste Chapelle it is tempting to head directly to the very nearby Notre Dame, but I suggest detouring to the Latin Quarter to enjoy some outside time. Now, I must admit, the Latin Quarter is not my favorite part of Paris, but the architecture can be interesting in parts, and once you get off the main streets, it’s definitely not all bad. There are some places in the Latin Quarter that I do not believe are worth visiting. Boulevard St Michel is touristy and can be more than a bit tacky. While the word Sorbonne may sound romantic, there is little to actually see once you get there. The Pantheon may look impressive from the outside but that’s about it. If you like the Middle Ages or tapestries, the Cluny Museum is well worth visiting, being home to the mysterious Lady and the Unicorn tapestry series. (It’s just off the corner of Boulevard St Germain and Boulevard St Michel). NB: the Cluny is closed for renovations until late 2018. My suggestion for a late lunch is the touristy, but pretty, street market on rue Mouffetard. After lunch, head back towards the river, but stay on the Left Bank side to visit Shakespeare & Co bookshop. You will note I haven’t specified a route for this walk. Avoiding the things I’ve outlined above, my suggestion is to grab a good map and find your own special part of the Latin Quarter – just try to come out on the river at or near Shakespeare & Co to pick up the tour. Next up: Notre Dame Cathedral. The Cathedral forecourt will be quite busy at this time of the day so do pay close attention to your belongings. 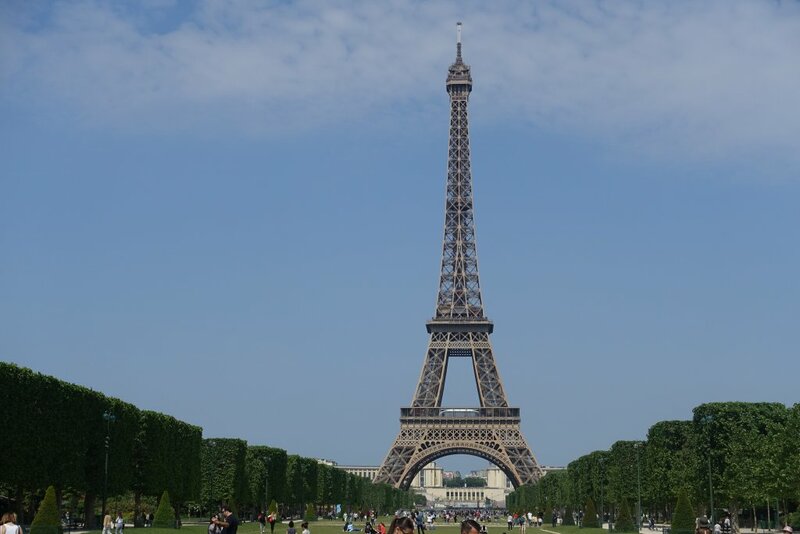 Before you finish your first day in Paris, it’s time to visit the Eiffel Tower. From Notre Dame take the Batobus (one of the companies offering boat tours along the Seine) down to the Eiffel Tower. After all that walking this is a relaxing way to see the city, and is one of my favorite things to do in Paris with kids. The Eiffel Tower is always busy and security is very tight, so you definitely need a skip the line ticket here (the Museum Pass does not cover the Eiffel Tower). This morning we are going walking again – this time along the Champs Elysées. I recommend you start at the Place de la Concorde where the Champs Elysées starts, although you can do this walk in reverse and start at the Arc de Triomphe instead. Before you leave the Place de la Concorde, step inside the re-opened Hotel Crillon. After a four year renovation it is recently reopened – looking is free. Start your walk on the left hand side of the Champs Elysées where the Grand and Petit Palais are. Their free exhibitions are not worth breaking your journey for, but the Grand Palais often has very good paid exhibitions, so do check out what is currently showing. 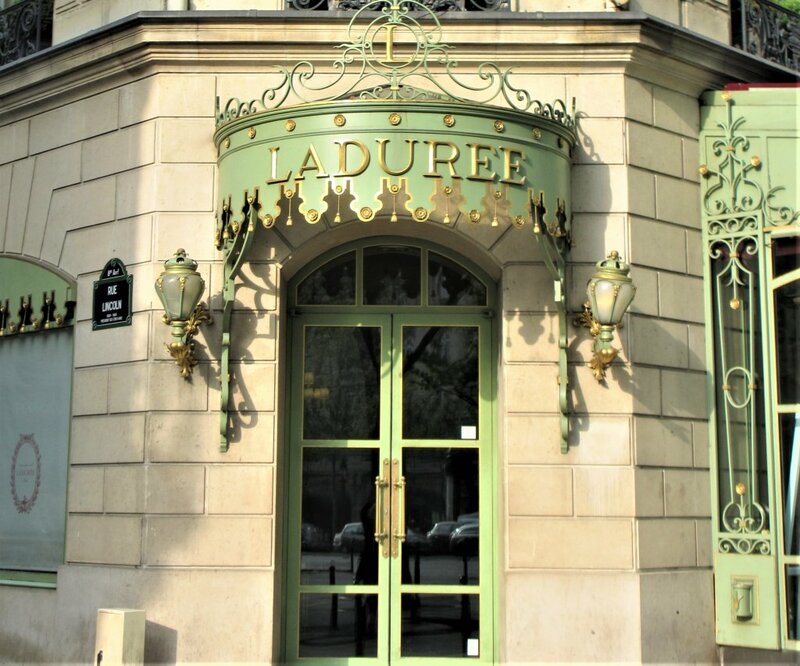 Further along the street (past the Renault dealership), Ladurée is at number 75. Regardless of your budget, do stop and buy a little something. A macaron can be had for a couple of Euro. It’s only a short walk from Ladurée to the flagship Louis Vuitton store – another pricy Paris institution which is also free to look in. Just watch out for scams here. Then it’s the Arc de Triomphe. If you want to get up close to the Arc de Triomphe, do not attempt to cross the traffic of the place d’Etoile as you will cause, or be involved in an accident. Instead, use the pedestrian underpass on the right hand side of the Champs Elysées just near the Charles de Gaulle-Etoile metro entrance. When you have finished at the Arc de Triomphe stay on the right side of the street and head down back towards the Place de la Concorde. The historic Guerlain flagship store and Arcades Mall are down towards the Place de la Concorde. At the Guerlain store cross the road again, and continue back towards the Place de la Concorde until you reach Ave Montaigne (just near the entrance to Franklin D. Roosevelt metro). Ave Montaigne is one of the most fabulous streets in Paris being home to literally all the big fashion labels. 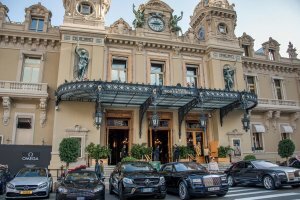 It’s also home to the luxurious Hotel Plaza Athenée (a good spot for a little sit down and a very expensive cup of coffee). For car lovers, the luxury care spotting on this street is second to none. Stop by Christian Dior and Dolce & Gabana for the best window displays. At the top of Ave Montaigne head across the Seine where if you look to your left, the Musée d’Orsay should be just near by. You need a skip the line ticket or Museum Pass for the Musée d’Orsay regardless of what time you visit – queues are always long. The entrance for skip the line ticket holders is at Entrance C (on the right hand side of the building). 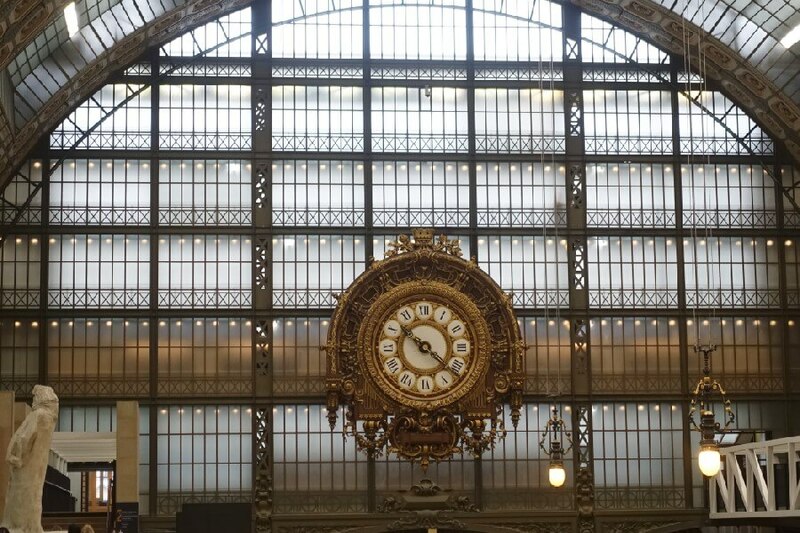 The Musée d’Orsay is smaller than the Louvre, but you still need to allow around 2hours to do a visit justice. 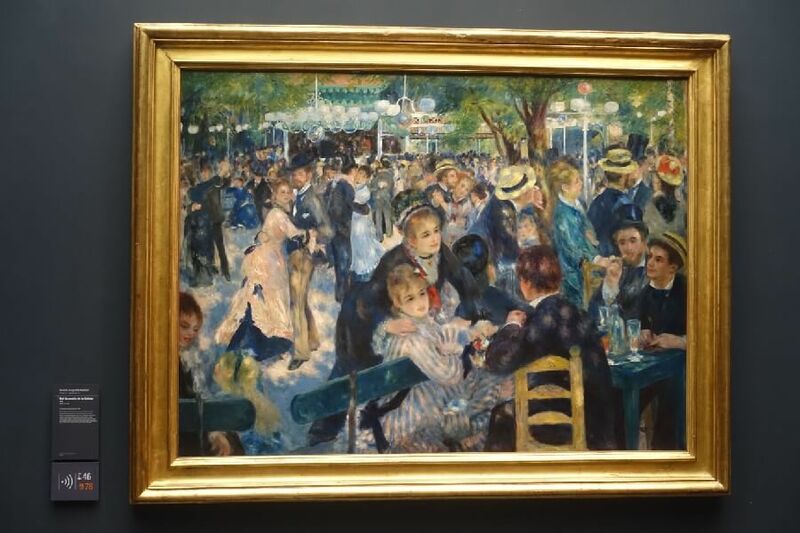 If you are short on time, or on interest, the big ticket Renoirs, Degas and Monets are upstairs. There are also some lovely views back over Paris from upstairs. For more detailed advice on what to see at the Musée d’Orsay you can read my Musée d’Orsay private tour here. On a three day Paris visit there’s definitely time for shopping. To minimise traveling time, and maximise your shopping time I’m suggesting you stay on the Left Bank and either walk or take the short metro ride to Le Bon Marché (metro Sévres Babylone). There are two building to Le Bon Marché – the main building with the usual department store stock and the next door Grand Epicerie, Le Bon Marché’s fabulous food hall. Even if you aren’t into shopping, the main building has stunning architecture that is well worth checking out. What should you buy at Le Bon Marché? It obviously depends on your taste and budget, but pastries or sandwiches are just a few Euros (there is a sweet little garden at the Metro entrance where you can sit to eat.) The main building has a lovely stationary department, with gorgeous notebooks and all sorts of other goodies. They also stock a huge range of beautiful French table and bed linens. And then of course there’s fashion. Scarves, ties and hosiery are very French and not necessarily expensive. The lingerie department is very, very good but I have found the service inconsistent over the years. Three days in Paris allows you to do the best day trip from Paris – a trip to the Chateau of Versailles and its gardens. Versailles definitely deserves a full day of your time to enjoy the best of the Chateau and its gardens, so don’t scrimp on your time here. How to get to Versailles from Paris: Versailles is an easy 35min train trip from Paris. 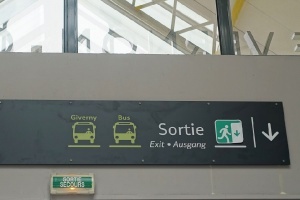 To travel to Versailles from Paris you need to take the RER from any of these RER stops: Gare d’Austerlitz, St Michel, Musée d’Orsay, Invalides, Pont de l’Alma or Champ de Mars. At the RER station you can catch any train that says Versailles Chateau RG or Versailles Chateau Rive Gauche (there are other stations at Versailles, but the Rive Gauche is the closest to the Chateau.) To return to Paris you can catch any Paris train. When you exit the Versailles station turn right out of the station, then take the first boulevard left. It’s about a ten minute walk. To make the most of your day trip to Versailles, beat the crowds by leaving Paris by 8.00am, which will get you to the entrance to the Chateau when it opens at 9.00am. If you’re not a morning person, and arrive later, go to the gardens first, then enter the Chateau after 2pm when the tour groups are more likely to have left. Planning your visit to Versailles: assuming you arrive nice and early, hit the Chateau first. Then visit the gardens (including the Trianon and the Domaine de Marie-Antoinette). My favorite tip for lunch at Versailles is to either enjoy a well prepared meal in the cafeteria-style eatery near the entrance, or even better, to take a little picnic to enjoy in the garden. Pick pockets are prevalent within the Chateau, so keep your bag, and valuables close. The Chateau and gardens are especially busy on Tuesdays (when many Paris attractions are closed) and on Sundays, so unless you have no choice avoid those days. How to get to Disneyland Paris: take the RER A to Marne-la-Vallée-Chessy. At the platform before you get on, check on the screen that your train is servicing Marne-la-Vallée-Chessy because this line splits in two towards the end. Best places to catch this train are from Charles de Gaulle-Etoile, Auber, Chatelet-Les Halles or Gare de Lyon. The train takes around 45minutes and the station is right at the park. Avoid the worst of the Disneyland Paris queues by avoiding weekends, Wednesdays and public holidays. You can use their FASTPASS system to avoid queueing for some of the most popular rides. Buying your entry tickets in advance will save queuing to enter. Art lovers can trim back their Latin Quarter walk to make sure they have plenty of time to enjoy the Cluny Museum on the first day. On the second day, take the metro to the Quai Branly Museum from the Eiffel Tower for what is possibly the world’s best collection of African, Polynesian and Asian Art. Then spend the afternoon at the Orsay. Art lovers have a choice on the third day of their visit to Paris – either the Pompidou or Picasso Museums, although I’m sure there will be some who will do both. Garden lovers will spend less time inside the museums and will make more time for the Luxembourg and Tuileries gardens. On the second and third days there’s a choice. 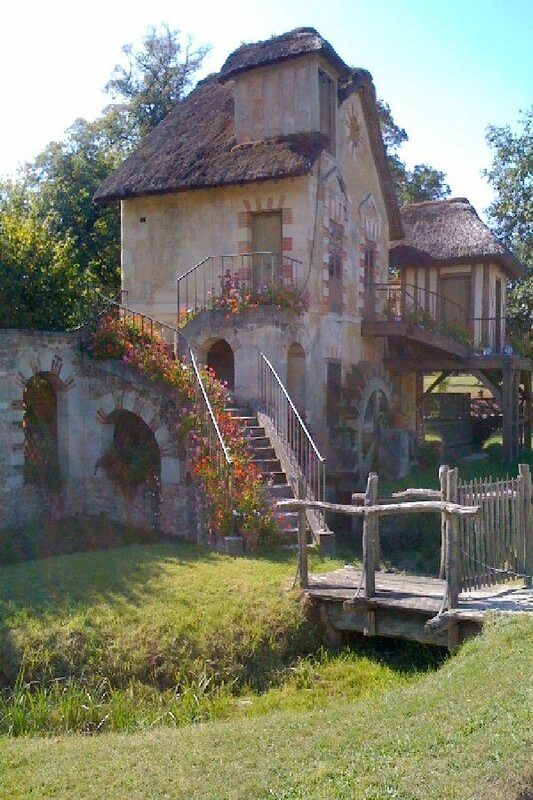 You could either complete my two day itinerary and save Giverny for day three, or do Giverny on day two, and then head to Versailles on day three. The gardens of Versailles are definitely not of the detail of Giverny, but their sheer scale, and formal French style make them a winner for gardeners. On your first day, start the day with a special breakfast Angelina’s just across from the Louvre. Stopping at Ladurée or the nearby Fauchon is a given on the Champs Elysées. Rather than spending time in the main store of Le Bon Marché, enjoy the gorgeous Grand Epicerie food hall. 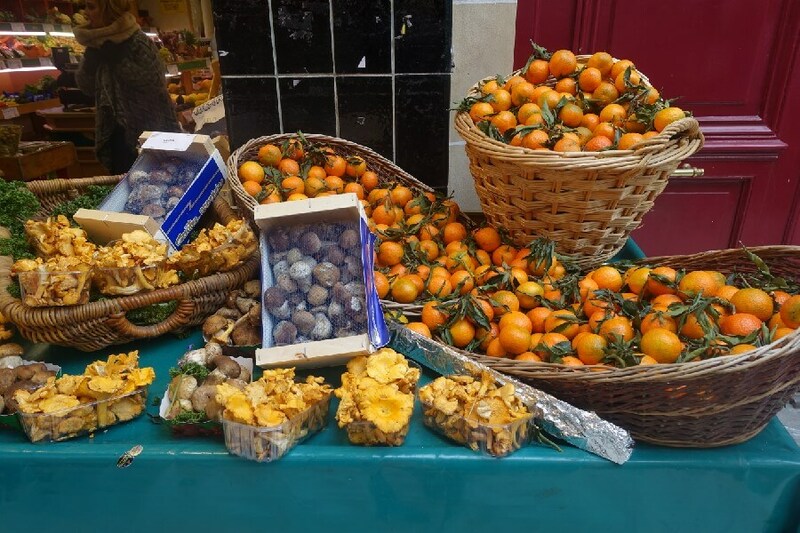 If you happen to be in this part of Paris on a Tuesday, Friday or Sunday, try to be at the nearby Marché Raspail while it is open between 7.00 and about 2.30pm. The market is on Boulevarde Raspail between rue du Cherche-Midi and rue de Rennes (metro Rennes). This market is organic (bio) on Sundays. On day three, take the day trip to Versailles and enjoy the finest dining at Gordon Ramsay au Trianon ( in the Trianon, book well in advance). Budget food lovers can curate a gourmet picnic to enjoy when they shop at Le Bon Marchée on day two (there is also a Ladurée at the Chateau). why spend time and money on the Eiffel tower when the best view of it as well as Paris is the free and relaxing roof terrace of the Printemps department store just by the Paris Opera. I think your point is very well made Cherstinne, and yes, that’s one of my favorite views of Paris too, but honestly, could you imagine if I published an itinerary for Paris and didn’t include going up the Eiffel Tower? The comments!!! !